Animal testing — including the vivisection of monkeys, cats and dogs — is routine for The Scripps Research Institute. Their facility on Florida Atlantic University’s Jupiter campus is the largest animal research facility in the state of Florida. 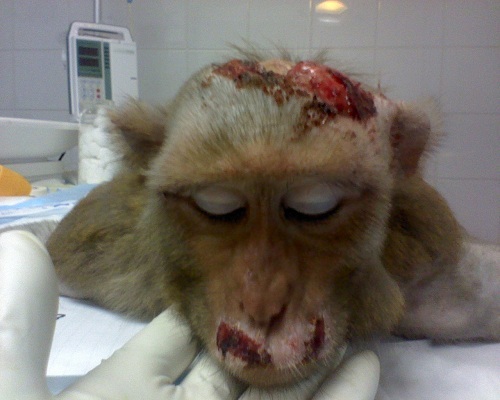 “I believe I am not interested to know whether vivisection produces results that are profitable to the human race or doesn’t. To know that the results are profitable to the race would not remove my hostility to it. The pains which it inflicts upon unconsenting animals is the basis of my enmity towards it, and it is to me sufficient justification of the enmity without looking further. It is so distinctly a matter of feeling with me, and is so strong and so deeply rooted in my make and constitution, that I am sure I could not even see a vivisector vivisected with anything more than a sort of qualified satisfaction.” – Mark Twain in a letter to the London Anti-Vivisection Society, May 26, 1899. Excellent website. Plenty of useful information here. I’m sending it to several buddies ans additionally sharing in delicious. And obviously, thanks for your sweat!